We had friends over for a Nut Roast dinner on New Year’s Day and one of the dishes that I did was a squash gratin. To make this we broke into one of our enormous Boston Marrow squashes. This meant, of course, we had tons left over. We roasted and mashed some for the freezer, made squash curry, squash scone and squash soup. We still had some left over, so it seemed like an ideal ingredient to use up in this month’s We Should Cocoa challenge. As a post Christmas special, Chele has chosen leftovers, something we probably all have after the seasonal splurge. I then had to find a recipe. BrownievilleGirl came to my rescue and suggested I make these blondies, the original recipe for which came from Harry Eastwood’s Red Velvet Chocolate Heartache. I have been wanting to try one of her cake recipes for a long time. They are a bit different, substituting vegetables for butter, being gluten free and using less sugar than one would normally expect. I’m not convinced by the idea that butter is bad for you, but I’m willing to try butterless baking occasionally and it’s always good to expand one’s repertoire. Beat 3 eggs (2 duck and 1 hen) with 120g vanilla sugar until thick, pale and creamy. Sieved and then folded in 50g buckwheat flour, 2 tsp baking powder (gluten free), 1 tsp ground cinnamon and 1/4 tsp Himalayan pink salt. Folded in 100g ground almonds. Poured half the mixture into a 9″ sq cake thingie, scattered over 100g chopped white chocolate then spooned on the remaining mixture. Scattered 30g almond flakes over the top. Baked at 180C for 25 minutes. This was definitely cake rather than brownie, but very nice nonetheless. I was mostly struck by the texture of the cake, which was beautifully light and not what I would have expected from a cake cooked with mostly ground nuts and vegetables. In fact, I couldn’t detect the nuts within the cake at all. I also loved its colour – yellow flecked with orange. It was moist with a nice crunch of nuts on the top. Neither was it too sweet, not until, that is, a chunk of chocolate was bitten into. This would be lovely to serve at a tea party for the health conscious or wheat intolerant; the chocolate could easily be left out for an even healthier version. Thank you BVG, I’m really pleased I tried this. Ooh it looks really good, and it’s supposed to be healthy?? Is the squash the veggie’s equivalent of the everlasting turkey then? Those squashes look great too. Oh my, this looks *amazing*! Gluten-free, and I can make it dairy-free too by using my vegan white chocolate 🙂 Love the idea of sneaking squash into an almond cake. I’ll have to try this soon! its almost healthy?!?!? that’s not right… however good it looks… I am most intrigued and more than prepared to try and make these… in the interest of science you understand! Fantastic looking cake – I love the height of it and the way that the texture looks so fluffy. Unfortunately, squash really upsets me so I shall just have to admire it from afar! Oh squash and cake, really? Wow I must try this. I like the idea of hiding the white choc in the middle too! Hmmmm, interesting – and much nicer than my recent WSC effort! Butterless brownies, whatever will they think of next! What a great cake… I am sending a link to my dairy/gluten intolerant brother! He will Love this! Chele – think it would be very hard to make a true butterless brownie, but I’m always happy to be proved wrong. Kath – those squash were rather big for just the two of us and our freezer filled up quite quickly. But they are great squash and we shall be growing them again next year. Hannah – if only it wasn’t for the eggs, this would be a good vegan cake. Dom – might not these be allowed on your new regime – as you say they are … sort of …. healthy? CC – I’ve never heard of anyone being allergic to squash before. Very happy for you to admire it though. Gillian – it was an exciting cake to make, I really didn’t know how it was going to turn out. Kitchenmaid – best not to think of these as brownies – wouldn’t want anyone being disappointed. Johanna – these are definitely not your typical brownies, which is why I prefer to think of them as cakes. Wendy – this is a great one for those on dairy and/or gluten free diets – as long as you don’t put the white chocolate in! Millie – thank you. Do let me know if you make this (or anything else). It’s always interesting to find out what others think. This looks simple, healthy and delicious. I’m all for it. Would be so good with a cup of tea in the afternoon. Thanks very much for sharing. Yum. Looks lovely, light and moist. My utter pleasure Choclette – delighted you like it! 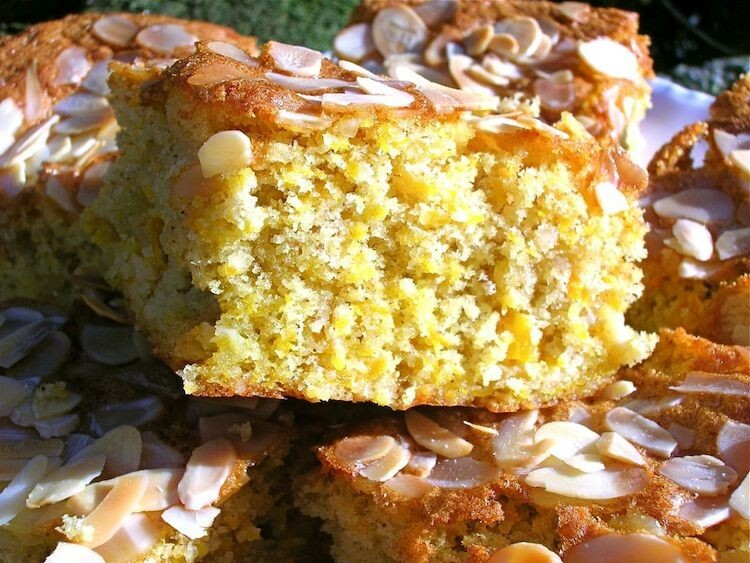 Fantastic recipe – I bake glutenfree all the time and this is a combination of ingredients I hadn’t come across before. A truly delectable slice of cake I see here. Thanks Camilla, it was a lovely textured cake and surprised me by being really light.